Their Last Full Measure The Final Days of the Civil War By Joseph Wheelan | What Would The Founders Think? Wheelan has written a powerful and absorbing account of the final days of the Civil War. He includes Lincoln’s assassination, the manhunt that followed and the failure of Reconstruction, as well as the post war lives of key military and civilian figures. Even readers steeped in Civil War history will find it worth their time and attention. 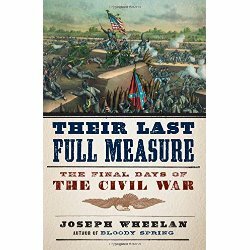 Their Last Full Measure describes the battles of the American Civil War, exposes the accompanying political skirmishes in Washington and Richmond, and details the suffering of the civilian populations of Virginia, Georgia and especially South Carolina, the birthplace of secession, and the object of William Sherman’s vengeance. The North’s “total war” strategy of destroying the South’s war-making resources was working; it was squeezing the life out of the Confederacy. The previous year had seen General William Sherman’s army march three hundred miles through Georgia, destroying barns, fields, railroads, and livestock along a sixty-mile-long swath. General Phil Sheridan’s army burned Virginia’s Shenandoah Valley, devastating Virginia’s breadbasket and smashing Confederate General Jubal Early’s army. Sherman, the avatar of “total war” was well pleased with the demoralizing blow he had dealt the Confederacy by his unsparing destruction of South Carolina’s cities, towns and countryside. “The simple fact that a man’s home has been visited by the enemy makes a soldier in Lee’s or Johnston’s army very, very anxious to get home to look after his family and property,” he wrote to General Quincy Gilmore, commander of the Department of the South in Charleston. Lincoln, having told Grant what was expected of him, left the waging of the war to the generals. Not so Confederacy President Jefferson Davis who insisted on micro-managing the Confederate military. 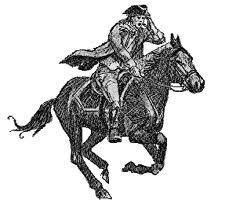 His interference intensified as the poorly provisioned, exhausted and outnumbered Army of Northern Virginia was forced to retreat. Confederate losses were accompanied by declining Southern confidence in Davis specifically and in the Confederate government in Richmond generally. Southerners had soured on Davis as the war progressed, and their enchantment reached an apotheosis with the loss of Georgia, Tennessee, and, now, Fort Fisher. Davis’s early state’s rights supporters had turned on him for instituting national conscription, and the rift between the Confederate states and Richmond had steadily widened. The Confederacy’s boundaries were shrinking, as was its access to weapons and necessities. Lee’s supply lines were compromised. The Union Navy’s increasingly efficient blockade of Southern ports essentially choked off exchanges of cotton and tobacco for desperately needed supplies smuggled from abroad. The Carolinas, Alabama and parts of Virginia and Mississippi were the last redoubts for which both Blue and Grey were prepared to give “the last full measure of devotion.” Grant’s army menaced Richmond and Petersburg on three sides. Petersburg was crucial to protecting the five rail lines that connected Petersburg to Richmond and supplied Lee’s army and the South. It was fiercely defended. The Union siege of Petersburg stalled for nearly 200 days. When repeated Union assaults failed, Grant turned to trench warfare. Both sides dug elaborate earthworks and trenches. …There were traverses to deflect flank attacks and a honeycomb of rifle pits, secondary ditches and embankments, and “bomb proofs,” where soldiers could hide during enemy bombardments. Beyond that, the engineers had dammed creeks to create water barriers up to 30 feet deep, and they were constantly boring tunnels, either in the hope of exploding or thwarting another massive mine like the one that union engineers had detonated beneath an enemy salient east of Petersburg on July 30. It obliterated the salient, killed 300 Confederates outright, and created a 30-feet-deep crater into which the badly led Union troops swarmed – and where they were slaughtered by Rebel reinforcements. These mines, countermines, and “listening galleries” for detecting enemy digging snaked for miles beneath the wasteland. The torturous defensive complexes eerily adumbrated the Great War trench systems of 15 years hence. One hundred and twenty-four thousand Yankees in the armies of James and the Potomac faced about 57,000 rebels in Robert E. Lee’s Army of Northern Virginia. They were in continuous contact. Every day sharpshooters and mortar fire killed some combatants from each side. There were feints and flanking movements, skirmishes, and full-throated battles. Death and misery were constant companions. Grant’s men endured the same cold, rain and snow as did their Confederate counterparts but they had warm clothing and plenty of food. Lee’s troops fared far worse. Their clothing was in rags; many lacked shoes and had nothing more than thin blankets to keep out the cold. Weakened by subsistence rations, sickness and scurvy depleted the ranks. Jefferson Davis backtracked on the Southern position that slaves were property and advocated arming slaves to resupply the hard-pressed and dwindling Confederate Army, possibly rewarding them with emancipation. Lincoln, when faced with the Union Army’s seeming inability to win a decisive battle, had countermanded his position that slavery was protected by the Constitution and issued the Emancipation Proclamation to sap the South’s ability to wage war. Now it was becoming clear even to avowed secessionists that the South had all but lost the war. Hoping to prevent further bloodshed with a negotiated peace, Lincoln agreed to a meeting of peace commissioners at Hampton Roads. But the February 1865 conference aboard the steamboat River Queen foundered on the rocks of Union and Confederate intransigence. The Union required disbandment of the Rebel armies, restoration of the Union and acceptance of the North’s new anti-slavery laws. The equally determined Confederates insisted on independence for a Confederate nation and the preservation of slavery. The only agreement that resulted was to exchange prisoners. Jefferson Davis, despite devastating losses, refused to accept the possibility of defeat and urged Lee and his generals to launch new attacks on the enemy. Not only did the Confederate Army lack food – typically the rations of six confederates equaled that of one Yankee – but also since 1862 nearly nine of every 10 officers had been killed, captured or wounded, leaving a severe shortage of Confederate combat officers. Nonetheless, with hope of a negotiated peace gone, General Robert E. Lee had no option but to fight on. And fight on he did until first Petersburg and then, on April 3,1865, Richmond was lost. Lee and his exhausted, half-starved army retreated West, Grant and his army snapping at their heels. A running battle ensued as each army moved farther to the West in an effort to out flank, or prevent being out flanked, by the other. Lee endured terrible losses. Two of Lee’s Army corps no longer existed. During this blackest of days for the Army of Northern Virginia Lee lost about one-fourth of his army, with 7,700 men killed, wounded, or captured. Union losses totaled 1,180. Lee, with no more than 20,000 exhausted, starving men, and shedding stragglers hourly, faced a Union force more than four times his number. Lincoln and Grant, magnanimous in victory and in hopes of fostering national reconciliation, sent the Confederates home with their horses for spring plowing and their personal weapons. So the war that that was supposed to be won in a few months was finally over after four blood-soaked years. Contrary to general belief, it had not been fought to free the slaves. Todd Brewster (Lincoln’s Gamble,) and Richard Brookhiser (Founders’ Son) books differ in many ways but in that they agree. Emancipation was a by-product, a means to an end, not a cause. Lincoln had publically advocated a gradual and compensated emancipation. The North fought to preserve the Union, “the last best hope of earth” he said in his 1862 Annual Message to Congress. The South fought to preserve its way of life against the burgeoning political, industrial and economic power of the North. Secession, that is independence, was the goal and preserving slavery was a necessary adjunct. Few owned slaves. Wheelan points out that in the early stages of the war the South with its superior military leaders was winning the war. Lee knew he could not prevail for long against the industrial and manpower behemoth of the North, but he hoped to erode enough public support to force Lincoln into a negotiated peace with terms acceptable to the Confederacy. But the North’s advantages “finally competently applied by Ulysses Grant and William Sherman” ended that hope. The author speculates about what Lee might have done differently. Wheelan has written a powerful and absorbing account of the final days of the Civil War. He includes Lincoln’s assassination, the manhunt that followed and the failure of Reconstruction, as well as the post war lives of key military and civilian figures. Even readers steeped in Civil War history will find it worth their time and attention. This reader found The Last Full Measure disturbing and almost unbearably sad. Embedded in memory is the carnage, the deaths of so many young men; generations forever unborn they never had a chance to father.